Paul Brown & Nate Harasim with special guest Deon Yates will headline 4th annual GRandJazzFest presented by DTE Energy Foundation. GRandJazzFest presented by DTE Energy Foundation brings 10 diverse jazz performance acts to the Rosa Parks Circle stage in Grand Rapids, Michigan on Aug. 15-16, West Michigan’s only free, weekend-long jazz festival. Anchored by veteran contemporary guitarist and Grammy-award-winning producer Paul Brown, The Producers is high-energy jazz. Brown produced the smash-hit Summer Horns album by Dave Koz. 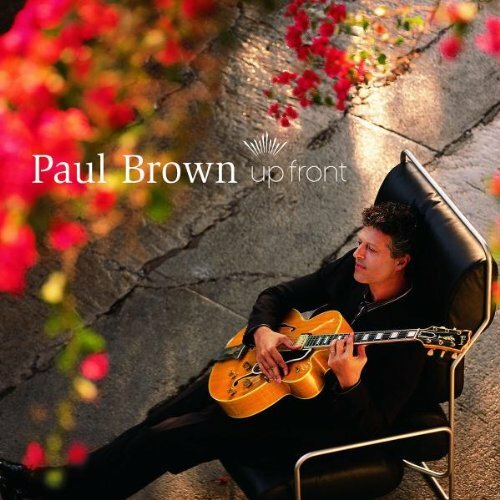 Brown’s own latest release, Truth B Told, has soared to the top of the jazz charts. A decade into his solo career, the guitarist sets the bar high for his genre by digging deeper into soul and blues, playing his 1963 Gibson Johnny Smith L-5 edgier and with more abandon. Nate Harasim, a Grammy nominee and Soul Train Award recipient, is a composer, keyboardist and multi-instrumentalist whose performances have included President Barack Obama’s Inaugural Ball and playing twice at the Dubai International Jazz Festival. The Michigan-based artist’s latest album, Rush, debuted on the Billboard charts at No. 17 and was the No. 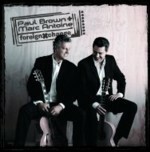 6 album of 2011 on SmoothJazz.com. Rounding out the trio is Saxophonist Deon Yates. No stranger to GRandJazzFest, the Detroit-based artist returns to the Rosa Parks Circle stage as a special guest of The Producers. After going solo in 2009, Yates is fast becoming one of the most sought-after emerging talents in jazz. His chart-topping release Spotlight featured collaborations with Lin Rountree and Nick Colionne. His new project, Saxafaction, produced by Nate Harasim with additional production by Paul Brown, is poised to become the next chart topper from these super producers. Saxophonist Steve Cole is GRandJazzFest 2015’s Sunday-night headliner. In the 15 years since the release of his debut record, Cole has traveled full circle and arrived back home on Pulse, the 10-song set mixing R&B, contemporary jazz, gospel, blues and pop. The new collection surveying Cole’s musical passions showcases the artist’s affinity for infectious melodies, a wall of horns and soulful grooves. In keeping with a tradition established with the first GRandJazzFest in 2012, the Grand Rapids Jazz Orchestra with vocalist Edye Evans Hyde opens the 2015 event. For more than 35 years, the Grand Rapids Jazz Orchestra has been one of Michigan’s premier jazz ensembles, featuring some of the finest musicians in the area playing swinging original compositions and arrangements as well as traditional favorites. 2011 West Michigan Jazz Society Musician of the Year Edye Evans Hyde has been singing jazz, blues and pop music for more than 30 years in West Michigan, Los Angeles, Asia and Europe. Over the years, Evans Hyde has shared the stage with world-renowned blues singer Linda Hopkins, pop singer Michael Bolton, vocalist Maria Muldaur, actress Connie Stevens, the late Ray Charles and Cuban trumpet player Arturo Sandoval. Walt Gutowski and The Bridge Street Band returns to GRandJazzFest this year. The popular local band played at the first GRandJazzFest in 2012. Native Grand Rapidian Gutowski has played guitar for years and his band performs at some of West Michigan’s most popular venues. Mike Frost Project 2.0 is new to the GRandJazzFest stage but no stranger to performing. For more than 30 years, Frost, a saxophonist, has been a prominent performer and bandleader in the Midwest. Hailing from Chicago and now living in Grand Rapids, he’s headlined many world-renowned Chicago jazz clubs as well as other performance spaces and festivals in the Midwest, including Taste of Chicago, The Chicago Jazz Festival, Jazzin’ at The Shedd, The Art Institute of Chicago, The Isthmus Jazz Festival and Days of Wine & Jazz. Grupo Ayé returns to GRandJazzFest 2015, having played at the 2012 and 2014 festivals. The popular West Michigan band specializes in Afro-Cuban music, which blends salsa, Latin jazz, bachata and merengue. 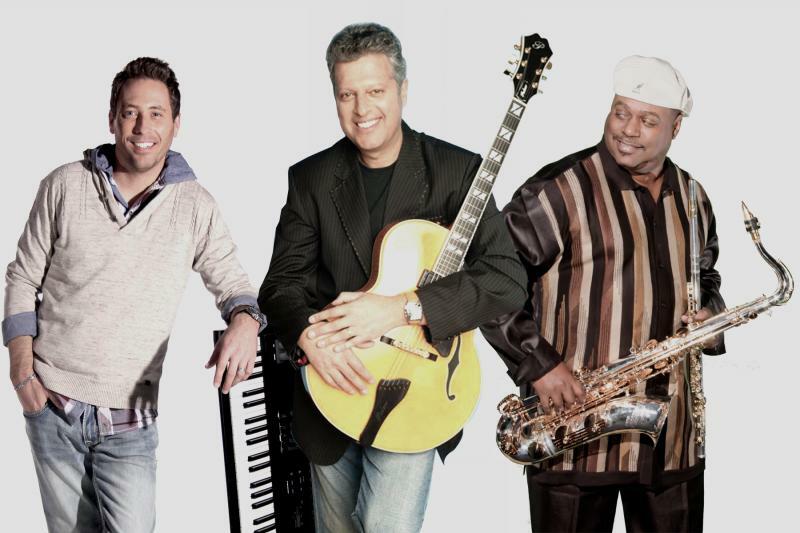 The group’s experience spans performances with such noted artists as Pat Metheny, Tito Puente, Wynton Marsalis, Celia Cruz, Aretha Franklin, Harry Chapin Jr., Englebert Humperdink and Paquito Rivera. Brian Simpson and Jackiem Joyner perform together at the 2015 GRandJazzFest. 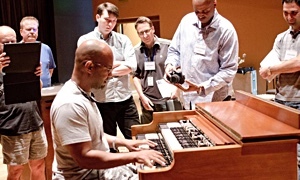 An inspired keyboardist, composer, prolific studio musician and producer, Simpson is a master of all he purveys. His eloquent approach to playing, sophisticated harmonics sense, bluesy overtones and R&B flavor have made him the go-to man for many, including Janet Jackson, Teena Marie, George Duke, Stanley Clarke and Dave Koz. Saxophonist Joyner is far from complacent in his sound and style. Not afraid to challenge the fan base that took him to No. 1 twice on the Billboard chart, he gets even more adventurous on his fifth album, Evolve. Big Band Nouveau delivers an authentic big band sound with some hard bop and modern mainstream jazz mixed in. The 16 members of the ensemblefrom all over Michiganbelieve in and live all things jazz. The eclectic nature of their music draws influence from the more modern era of the big band while still remaining true to the traditional big band sound. Fiery Spanish guitar and pop vocals fueled by his seven-piece Latin-urban band make Bryan Clarke Lubeck a rousing favorite with diverse audiences. His sensitive instrumental ballads coupled with the exciting flamenco styles from critically acclaimed albums have proved to a new generation of music lovers that the contemporary elegance of Spanish guitar is more powerful today than ever before, especially when combined with the grooves of his Latin-urban band. With the release of his CD, The Bottom Line, Michael Manson joined the ranks of today’s premiere jazz artists. His first single, Outer Drive, reached the top 10 on the R&R Smooth Jazz. The bass master moved from sideman to center stage on his solo debut, which became a Billboard Top 20 CD in contemporary jazz. A native of Chicago, he joined Brian Culbertson and began performing regularly on Chicago’s jazz circuit. In 1999, he was invited to play the Monteux Casino Lights Festival. Sharing the stage with the likes of Boney James, George Duke and Kirk Whalum, he made connections that would eventually lead to many performances the world over. GRandJazzFest presented by DTE Energy Foundation is a community event of the nonprofit 501(c)(3) organization “GR and Jazz” founded in 2012, with the purpose of promoting and bringing awareness of jazz and related arts to new and diverse audiences through educational programs and community events. GRandJazzFest 2015 is a FREE weekend-long event that runs Saturday, Aug. 15, from noon until 10 p.m., and Sunday, Aug. 16, from 1 p.m. to 8 p.m., featuring jazz artists who are primarily Michigan-based. GRandJazzFest brings together notable jazz performers as well as highlights up-and-coming artists for diverse audiences. GRandJazzFest is being held at Rosa Parks Circle, a central location in the heart of downtown Grand Rapids, where attendees can enjoy music, support local businesses and visit other Grand Rapids attractions. The festival is FREE.